What's hot in the kitchen? 1. First hard boil the eggs. Fill up a large saucepan half-way with water and gently add the eggs. Cover the eggs with at least an inch of water. Add a teaspoon of vinegar to the water. Add a pinch of salt to the water. Bring the water to a boil. Cover, and remove from heat. Let sit covered for 12-15 minutes. Drain hot water from pan and run cold water over the eggs. Let sit in the cool water a few minutes, changing the water if necessary to keep it cool. 2. Peel the eggs. Using a sharp knife, slice each egg in half, lengthwise. Gently remove the yolk halves and place in a small mixing bowl. Arrange the egg white halves on a serving platter. 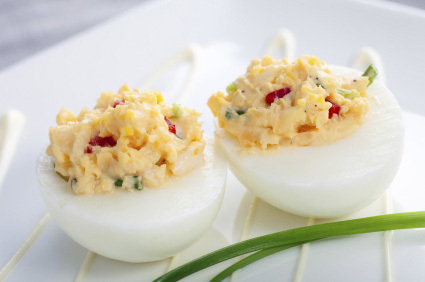 3.Using a fork, mash up the yolks and add mustard, mayonnaise, Steve's Pepper Sauce, onion or chives, pimento or red peppers, shredded cheese, and a sprinkling of salt and pepper. Spoon egg yolk mixture into the egg white halves. Sprinkle with course ground pepper and cayenne pepper. Serve..